I am a huge Indy fan and I’ve seen the movies and played the games a bajillion times. Given the fact that Disney no longer focuses on making games, and since they own Indy now, I’m pretty sure we won’t see another Indy game in the upcoming 10 years. 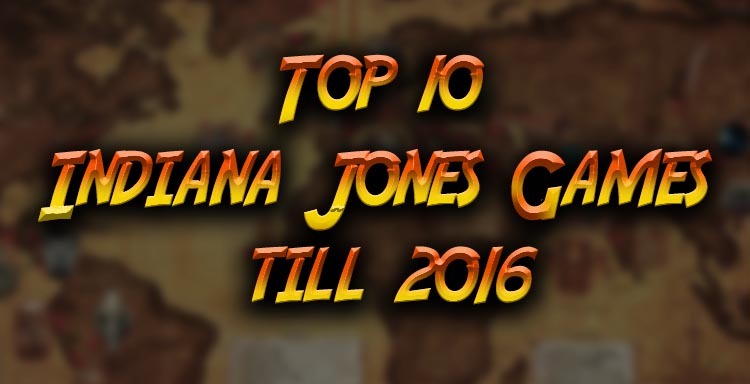 So, for all those of you who haven’t tried them all yet, here are the top 10 Indy Games till 2016. Well, I’m cheating a bit with this one, but trust me here. Some fans are so dedicated that they managed to make games that are better than the originals in many aspects. Sure, 99% of them are not finished, but they’re still fun to play! I’ve heard they’re making an HD Remaster of “Fate of Atlantis” so I’m looking forward to that. I remember playing Fountain of Youth (the demo) and I’ve read that some fans were working on a “Raiders of the Lost Ark” game, in pixel form. All in all, with a little research, you might uncover some hidden gems. Let me know if you find any! Not the best game I’ve ever played, but it’s still out there. It is decent… sort of. The action is kind of cool, but it’s not a very good platformer. Still, it is an “official game” so to speak, so it goes on the list. It’s either this or some obscure text adventure. Heh..
Well, ok, it’s pretty bad but it’s still Indy, right? Right?? Got this on my mobile phone and played it a little. It’s quite good and looks awesome! The controls are a bit tricky to master but, in the end, who doesn’t like a challenge? It has action, the whip-stuff is great, it can be quite fun if you get the hang of it. The graphics are very good, considering the game’s size, and the whole exploration element is there. All in all, if you’re into this type of games, it may be quite amusing. The only Indy game with randomly generated maps to explore. It’s simple, it’s very RPG-ish and it is perfect for a boring afternoon. To truly enjoy it you can set the difficulty on easy and just go explore. Can’t be worse than the Crystal Skull, can it? As a kid I found a demo of it on a weird German dvd with games that were quite obscure. Perhaps they had a special edition on less-known titles. I think I played it half a dozen times, just because there was nothing better to play at the time. I’ve had this game on a reaaaaally old PC, where I’d get 10FPS at the best times. It was a horrendous experience for me as a kid. Now, as an adult, I’ve had the chance of tackling it again and I must say… the years have not been kind to it. The controls are your worst enemy and the graphics are just… bad. If you imagine that it’s a silly little fangame made by someone with no PC experience, you can enjoy it. Otherwise, skip it. I haven’t played them yet, so I cannot offer a subjective opinion. Objectively speaking, what you see is what you get. If you have fun playing with LEGO, then you will have fun playing this game. It does require a bit of an imagination to fully get into them, but you won’t waste your money if you get these two Indy adventures. If they’re on sale. On PC. Under 5 bucks. Together in a bundle. …if there’s nothing better on Steam. Now we’re starting to talk about the good stuff. Being born in a country that had little access to, well, the good stuff, I had to pirate this game as a kid. Yarrr and all that, heh. I bought it on steam years later and I’ve noticed that it had sooo many issues, that I reverted to my pirated copy. Seriously. It’s a fun game, it follows the story of the movie and I can only recommend that you experiment and SAVE a lot. You still have Point A and Point B, but you can get there in different ways and through various routes. Worth checking out, just be patient. It can be a bit unforgiving if you rush into it. A beautiful game, excellent story – basically you get three adventures in one. This game got me into reading and history and wanting to become an archaeologist. The entire Atlantis Mythos is presented fairly decent and the sense of adventure is clearly there, even though sometimes it is hidden beneath dead ends and the need to use a walkthrough. It could have had a lot more uses for the whip and you never really get to use Indy’s gun (I don’t even think he has it on him) but nevertheless, fully voiced AND good music? All in all, this one is a “yes”. The latest installment in the Indy Games, Staff of Kings is focused on fun. It’s quite awesome to play and it has moments in which you actually get into it, trying to fight off the bad guys and survive a brawl. Despite it being aimed at kids, my bro and I had fun playing it, especially in co-op (it has a bundle of levels separated from the main story which are fun to play). It’s great for the Wii and definitely something good for the Indy franchise. Still, your arms end up hurting after using the whip a million times. This… this is good. It’s fun. It makes you feel like Indy all the way through. It’s dynamic, the music is perfect, the action is awesome! Even the graphics are ok-ish for this day and age, even if the story kind of falls flat due to bad representation. If you’re an Indy fan, this is the perfect go-to game while you wait for the Fifth Movie. Let’s just hope they don’t ruin this one, eh? What’s your favorite Indy game? Leave you answer in the comments below, thanks for reading!